"Transfer of Development Rights" (TDR) programs allow local governments to put economic principles to work in encouraging good land use planning. TDR programs most often permit landowners to forfeit development rights in areas targeted for preservation and then sell those development rights to buyers who want to increase the density of development in areas designated as growth areas by local authorities. Although TDR programs must conform to zoning laws, they provide market incentives that make them more equitable (and often more lucrative) for sellers and frequently benefit buyers by allowing them to receive prior approval for their high-density development plans. Since the 1970s when modern TDR applications were first conceived, more than 200 communities in 33 states across the U.S. have implemented TDR-based programs. The most common uses of TDR to date involve protecting farmland, environmentally sensitive land, historic sites, and "rural character," and urban revitalization. Until now, however, there has never been a clearly written, one-volume book on the subject. At last, The TDR Handbook provides a comprehensive guide to every aspect of TDR programs, from the thinking behind them to the nuts and bolts of implementation-including statutory guidance, model ordinances, suggestions for program administration, and comparisons with other types of preservation programs. In addition, six of its twenty chapters are devoted to case studies of all major uses to which TDR programs have been utilized to date, including recent urban revitalization projects that utilize TDR principles. 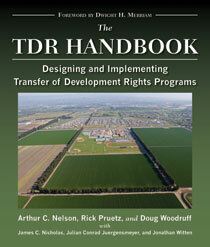 "The Handbook is thoroughly comprehensive, addressing virtually every conceivable issue about TDR. It provides copious examples and explanations of when to use TDR in short, readable chapters, particularly for urban redevelopment which few sources have previously explained. It should be on the shelf of every public official, attorney and planner dealing with preservation of open space, natural resources, and the built environment." David L. Callies, FAICP, author of "Regulating Paradise: Land Use Controls in Hawaii"
"The TDR Handbook will be the primary source on the topic for years to come. The authors provide detailed explanations of the strengths and weaknesses of transfer of development programs, illuminated by useful, insightful case studies with a range of applications from urban design and historic preservation to farmland protection and environmental management." "The authors have succeeded in making the tricky concepts of TDR understandable and accessible to readers ranging from the casual interested citizen, to experienced planners and practitioners of TDR, to elected policy makers. Especially worthwhile is the thorough review and analysis of the demand and supply dynamics of TDR economics— a most important ingredient to creating effective markets in transferable development rights."